← Thinking about buying a Seattle Floating Home and wondering what it is like living on Lake Union? This Summer has been especially sunny and warm, and so it was when I visited Artist Fred Lisaius, the first weekend of September, at his studio at the Inscape Building. I first met Fred about 6 years ago at his opening at the Linda Hodges Gallery in Pioneer Square. I remember telling him how mysterious and otherworldly his floral landscapes, bathed in late afternoon and early dusk light, looked to me, and I was looking forward to talking with Fred about his current work at his art studio. When I entered Fred’s high ceiling studio, the first thing I noticed was the glorious light coming in from the large window with it’s perfect artists’ northern light, then on my left, the studio’s larger area with about eight smaller paintings hung on the wall, ready and for sale during the Innscape Open Artist Studios event in a couple of hours. Fred pulled out a couple of chairs so that we could chat while looking at his small paintings, some florals, a bird, and his flying honey bees. Fred also paints large scale paintings, but those were not out on display because those will have their debut at his next solo show, this coming Spring at Patricia Rovzar Gallery. 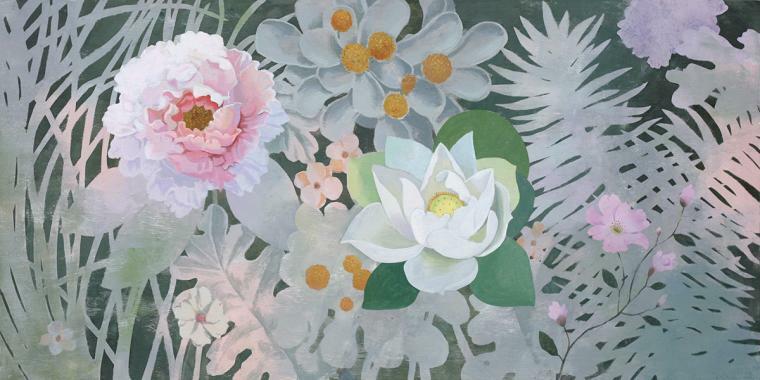 It is Fred’s larger, more complicated floral paintings that I am most acquainted with and we started talking about what influences his work – nature. Fred has enjoyed being outside his whole life, fishing and hiking, and it is there in the natural world that he finds his inspiration. Fred told me that: “Nature is a mirror to how we understand ourselves better.” “In nature you see balance and harmony, and you see a lot of metaphor for ourselves in nature”. 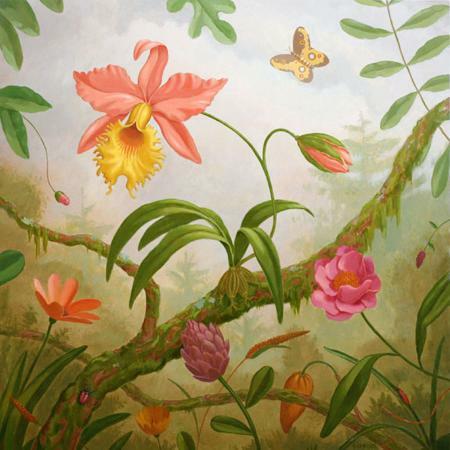 I always had a feeling that the flowers Fred painted while resembling real flowers, like orchids and tulips, they grew in ways they do not in nature, so to me, they seemed sentient and to move about in their rarified world within Fred’s paintings. 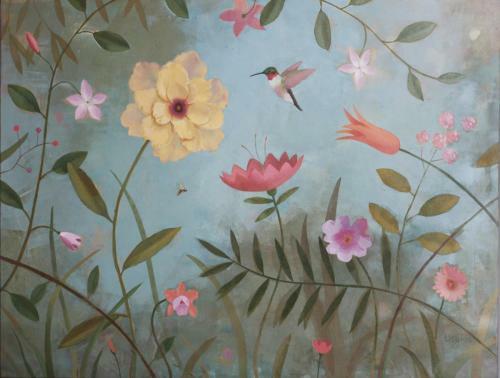 Every flower, insect, leaf and bird is unique and exists on it’s own, yet still, they are connected where they touch and within the boundaries of Fred’s paintings. Rather like the individuals we all are, we exist both separately, and are connected by our interactions. 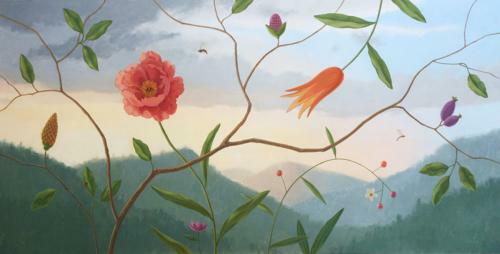 Some of my favorite of Fred’s paintings are his large scale floral paintings like “Mountain Garden”, “Glow”, “Forever” and “Mary’s Tree ” which are like windows allowing me to look into a secret world where life is just slightly different from ours. Fred recently did a commission for someone outside of Washington State called “Family Tree” which was an opportunity for him to do a very personal painting for someone. 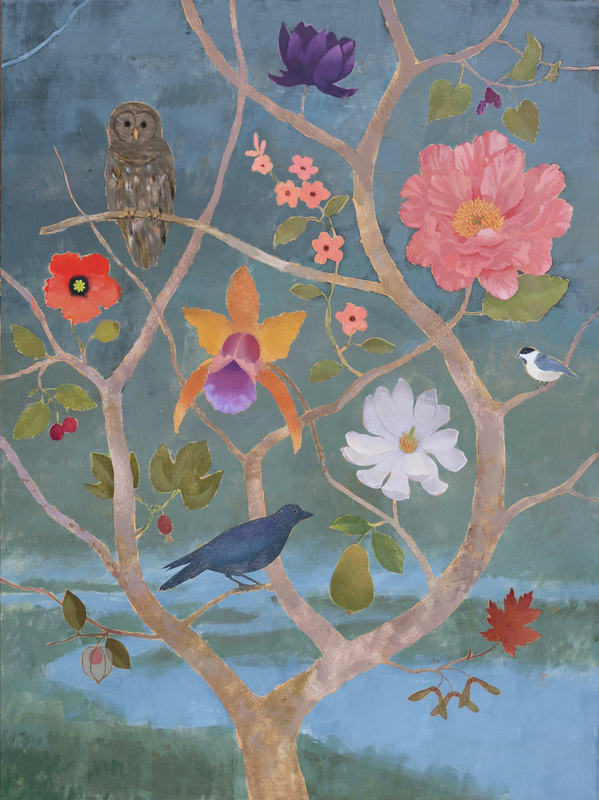 He spent a few hours talking on the phone to his client to hear her stories and out of it he painted for her, his “Family Tree” with visual manifestations of things and events important to his client. I love the idea of this, Fred says that in it, you “see windows in the painting, natural conversations that express meaning”. Personal commissions of this sort are particularly interesting to Fred because it is not a literal painting of a person, pet or thing, but rather a tapestry of a person’s life. A couple of the small paintings on display while I was there, were of a single honey bee flying through the air, one with a peaceful blue sky with clouds, and another in a sky filled with a fiery sunset sky. 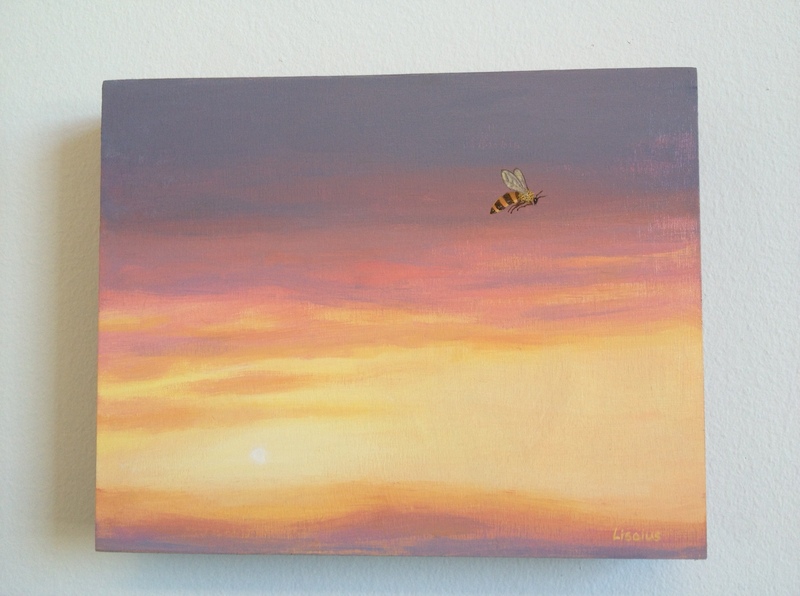 Fred started his Bee painting series a few years ago, smaller paintings, which are “about the individual journey” we all experience. Fred was inspired to paint the honey bees when he first read about them dying off from an unknown disease, perhaps caused by our pesticides…the bees of course are a metaphor for us. Other insects also occupy Fred’s sculptures in his cast resin artwork. These were inspired by tree sap drowned flies that have aged into amber and used in jewelry. Fred finds metal detritus in parking lots and road gutters that he assembles into fantastical insects, like a firefly he made from a lost license plate light he found in a parking lot. The bulb became the abdomen of the firefly, the part that lights up on Summer evenings to attract a mate, and the rest of the firefly was constructed with other found metal pieces. 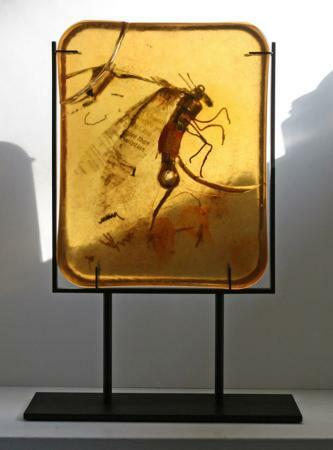 After Fred assembles his insects, they are entombed with resin and when cured, mounted in a metal display holder. When I look at them, I find them lovely, and a touch disturbing given the materials the insects are made from and their larger scale. It was a wonderful hour talking with Fred and as I was leaving I mentioned how much some of his floral landscape paintings reminded me of tapestries like the “The Unicorn is in Captivity and No Longer Dead” tapestry, and interestingly, he told me that he enjoyed seeing the Unicorn tapestries, as a young man, at the Cloisters in New York. You can see a bit of it’s influence in Fred’s paintings, secret worlds unto themselves. 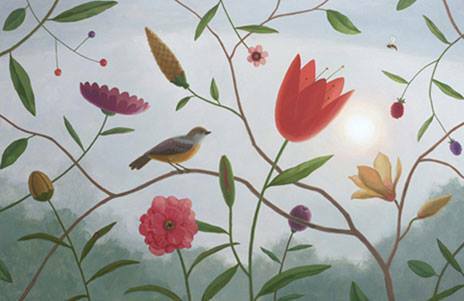 You can see Fred Lisaius’ work on his website, small works in his studio at Inscape Arts Building every third month Open Studios and this Spring at Patrica Rovzar Gallery. 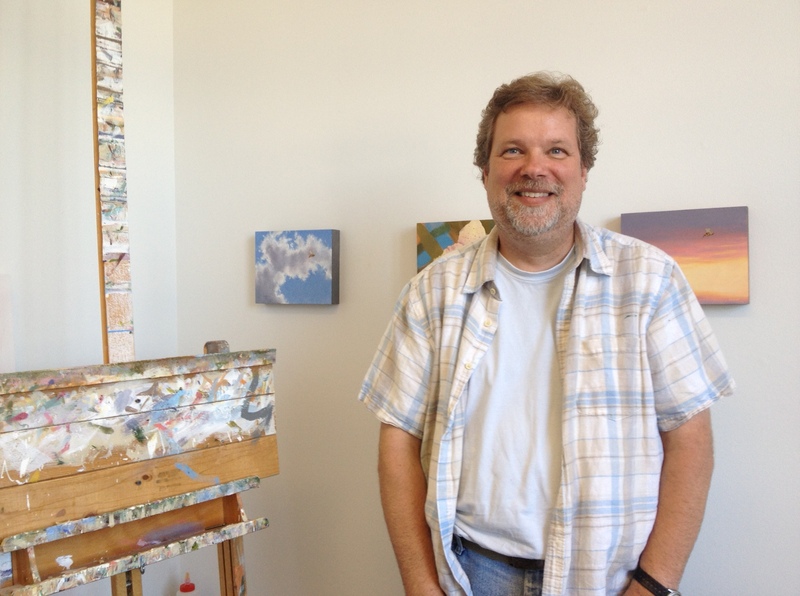 My thanks to Fred for taking the time meet with me in his studio and talking with me! 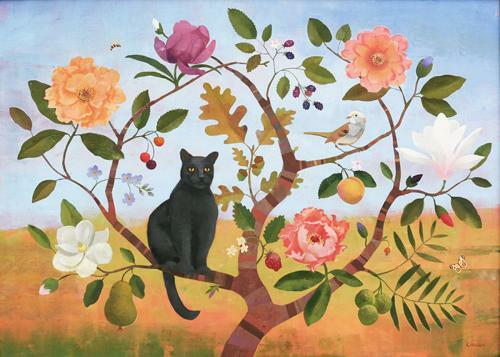 This entry was posted in Artists and tagged Artist, Fred Lisaius, Studio Visit. Bookmark the permalink. I love, love, love his resin cast bugs!